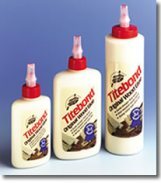 We also stock a range of Devcon epoxy resins, UHU POR Foam adhesive, Squadron Filler Putty, Engine After-Run oil, Gorilla Glue, and Titebond Wood Glue all of which are offered below at discount prices. MSDS (Material Safety Data Sheet) information for these products can be viewed by clicking on the links below. You will require a PDF Viewer such as Acrobat or Microsoft Edge to open these data sheets. with zero value and will not be sent when back in stock. If you would like us to inform you when they are available, please e mail us. Super thick & strong. For use on high stress areas, laminating and forming fillets. Poly-Zap Depends on material to be bonded. Activator for ZAP and all other cyano adhesives. Pump spray applicator. Please note that due to changes UK postal regulations, we regret that we are unable to despatch this item to addresses outside of the UK. Specifically designed for use with Zap Odourless on foams. A gel debonder that softens cured cyano adhesives so it can be removed from surfaces. This is a liquid debonder that softens cured cyano adhesives so it can be removed from surfaces. Fast cure clean drying 'white' glue. Bonds canopies and plastic parts without blooming. Full cure in 24 hours. Protects screws from loosening through vibration. Small bottle ideal for low usage. Protects screws from loosening through vibration. Larger bottle than Z-42 so more economical for heavier users. White hobby filler. Apply straight from the tube, leave to dry for 30 minutes and then sand to shape. Does not shrink with age. Americas top selling model filler. Cannot be used on foams. A general purpose epoxy putty which can be used for modelling and filing large gaps. Click here for a more detailed description of the Milliput range. Probably the best way to mix the correct qty's of resin and hardener. Great for field repairs. need to contact you with regard to a revised shipping charge. Of course you will have the option of cancelling the order if you prefer. Shipping to UK addresses is not affected. PT38 High strength quick setting epoxy resin - sets clear. PT39 Maximum strength epoxy resin - sets clear. Aliphatic White Wood Glue - bonds stronger than the wood itself. Strong initial tack and sands easily. Americas most popular wood glue. suitable for indoor and outdoor use. Strong initial tack and sands easily. All purpose expanding polyurethane adhesive. Glues virtually any material including woods. metals, stone, foams, glass and many more. Expands to 3x volume during the cure process so excellent for gap filling applications. Protects engine bearings from damage from corrosive combustion residue of glow fuels. that we are unable to despatch this item to addresses outside of the UK. Please note that adhesive cure times are given as a guidance only any will of course be dependant upon room temperature and the materials being bonded. Please note that exposure to Cyanoacrylate fumes and Epoxy Resins can be harmful - always ensure adequate ventilation, wear eye protection and gloves, and follow the guidelines on the containers.